Guest post by Wadud Hasan – From a young age, Wadud has traveled to communities across the US for programs, seminars, conferences, and had been a key leader during the launch of several Mosques and full time schools in the North Dallas area (by His enabling grace). He is currently completing his graduate studies in Leadership and Organizational Performance at the Vanderbilt University Peabody College, a top ranked school of education based in Nashville, Tennessee. Based on Peter Senge’s The Fifth Discipline: The Art & Practice of the Learning Organization. System Thinking is a discipline for seeing the wholes, seeing interrelationships rather than linear cause-effect chains, and seeing patterns of change rather than static “snapshots.” In complex systems. Cause and Effect is a not a linear but a circular pattern – an important axiom is that every influence is both cause and effect and nothing is ever influenced in just one direction. Systems thinking empowers us to address the sense of helplessness when people say: “It is the system. There is nothing we can do about it.” – because Systems thinking is a discipline for seeing the “structures” that underlie complex situations. The way we try to address problems through short-term solutions without understanding how the whole system works often produces dramatically different effects in the long run. But systems thinkers need to be patient as Time Delay occurs in a system since actions in a complex system do not always have immediate outcome. So a Systems thinker needs to prepare for the delay. Quick solutions without understanding the dynamics of a system can produce Unintended Consequences. Faith based organizations, and places of worship play a tremendous role in shaping today’s youth as productive, contributing citizens of tomorrow. The American Mosques have long preserved the faith, character, and social network of the Muslims in America. While these mosques have acted as nuclei for building productive communities, the newer generations of American Muslims increasingly feel a need to take these Mosques to the next levels as comprehensive community centers as they deem many of our mosques as stagnant in the “developing” stage due to lack of commitment, understanding, vision, and systems thinking. Systems thinking can reveal the short and long term scope of impact of our Mosques; firstly in the lives of American Muslims and then in the betterment of lives of our extended communities – our neighbors of all faith and cultures. A greater depth in Systems thinking will eventually show how impactful some American Mosques have been in producing even a global impact and what all Mosques can do to reach such a level. American Muslims are able to practice their religion freely in America in a very pluralistic Muslim community often capable of free themselves from cultural biases. This has helped the good bulk of them to become more open in understanding and embracing our differences. This leads to increased tolerance, and greater conversation within the intra-faith and interfaith space. However, one of the issues that many American Muslim communities are still trying to work through is the unmet needs for more home-grown religious leaders. Many Mosque boards are still first generation immigrants with biases rooted in their cultural origin and often are not very aware of this. Many such boards continue to hire immigrant Imams that cannot present their knowledge within the American context and hence are not able to reach the desired level of success in attracting the youth (pre-teens, teens, college students, and young professionals). While an increased number of communities across the US are becoming more aware of this issue and are starting to hire American born Imams that can make faith relevant to our youth, a large number of growing communities are yet to take the leap. Systems thinking at American mosques can also generate greater awareness of where we are lacking in service. We need to connect with, cater to, and take care of our elders. We have to dedicate an increased number of programs for them, listen to their wisdom, and help bridge the gap between them and the younger members of the community. Our Mosques also need to pump out programs, events, and social opportunities for the young working adults – counsel them and provide services as they get ready to start a new family, have children, and need new knowledge, skills, and network to be successful in these new roles. Support for new parents, family friendly events, childcare facilities, children’s extra-curricular clubs, and events are direly needed. Events, sports, academic, and extra-curricular support is another area we can engage in after-school to serve our Pre-teens and Teens. Mosques can especially play an important role in providing such after-school programs in cities where the public schools are failing and children regardless of their faith and background can use extra academic, and extra-curricular support to get ahead in school. Reducing high school dropouts, and developing conscious citizens is a national commitment that many of our resourceful communities and mosques could play an important part in. All these services need to be provided in right proportions and should be developed strategically in phases to build capacity and to keep everyone engaged. Paid and full time religious leadership and support staff play a key role in making sure that our Mosques are meeting all these needs of our communities and do not become stagnant organizations. Many great Imams – who are youth centered and yet have the ability to connect with the adults in the community, are not able to keep up with the increasing demands for all the services people need. And the mosque boards and trustees are failing to activate the principles of Systems thinking to find a solution. Systems thinking involves critical thinking about the cause and effect of every decision we make. Our communities are continuously talking about the need for raising more funds, and lack of funds is used as an excuse to justify why the only full time employee at the mosque should be the Imam or if you are lucky you also have a full time Office Manager. But the buck stops there! One of the biggest complains of the American Imams is that the majority of their time gets spent on counseling the community members – issues related to marital relations, parenting conflicts, and mental health. The compensation package is another major area of concern – many organizations are lacking in their salary standards and are not able to attract or sustain talents that are maturing beyond the scope of the current organizations. When the Mosques do not mature and evolve along with its talent – they are losing great human capital resources and are not able to replace these voids. Lack of understanding of this cause and effect relationship has made leaders oblivious to the need for creating the infrastructure needed to allow the Imam to carry out their main responsibilities of spiritual leadership, community relations, vision creation, and program development to name a few. 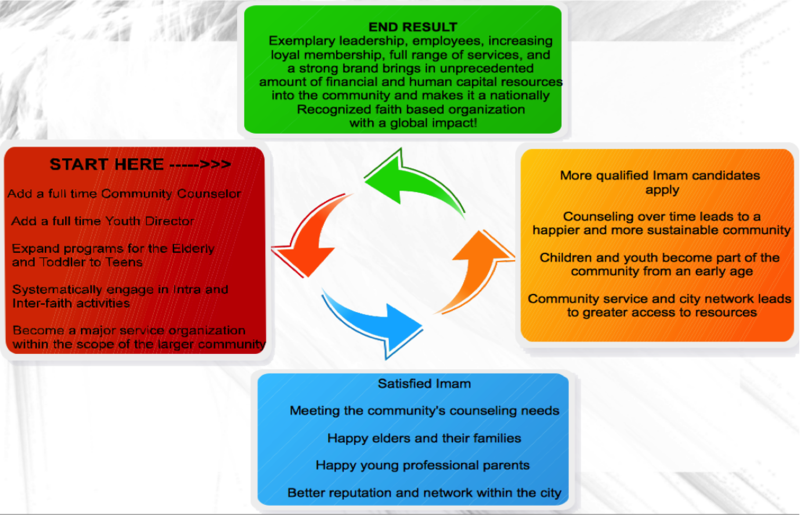 Figure 1.1 -Understanding the entire system of cause and effect relationships, the time delays of return on investments in our community, and the harmful unintended consequences of quick fixes based on partial short term systems view can help shift the mindset of the Mosque leaders across the US. • Senge, P. M. (2006). The fifth discipline: The art and practice of the learning organization. New York: Doubleday/Currency.